Prototype: German Federal Railroad (DB) class VB 98 rail bus trailer car with a service compartment. In original crimson paint scheme. Trailer car road number VB 98 034. The trailer car looks as it did at the start of the Sixties. Model: This trailer car goes with the 39978 rail bus set consisting of a motor car and a control car. Both ends of the trailer car have pockets with guide mechanisms for current-conducting plug-in coupling drawbars. A current-conducting coupling drawbar is included. There is a clear view through the trailer car's interior space. The trailer car has interior details. It also has interior lighting with maintenance-free warm white LEDs. The current supply for the interior lighting comes from the current-conducting coupling drawbar connected to the motor car. Length over the buffers 16.0 cm / 6-5/16". 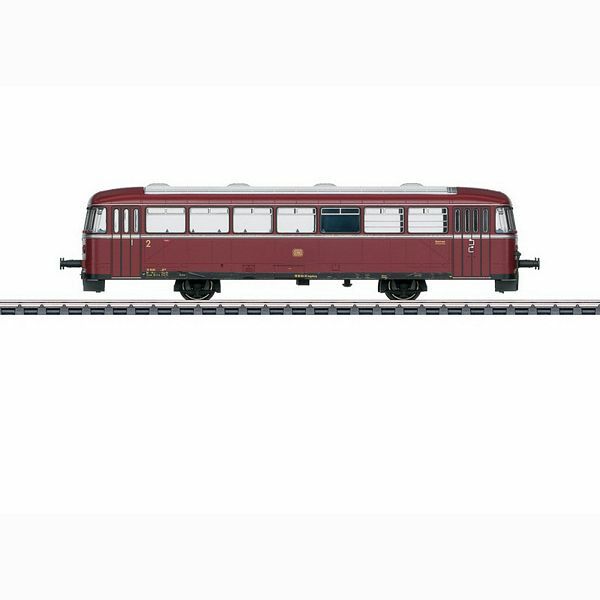 This car is the right add-on for the two-part rail bus set consisting of a motor car and a control car that is available under item number 39978.